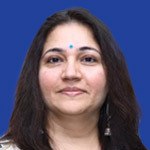 Aarti David is Director, Publishing at SAGE India. She jointly heads books and journals commissioning along with marketing. As head of commissioning, she oversees all the streams SAGE publishes in English and Indian languages. This currently includes SAGE India Journals, SAGE India (Academic Books), SAGE Texts (Textbook publishing programme), SAGE Response (Business and Management Books), SAGE Select (Non-Fiction), SAGE Bhasha (Indian language publishing program), SAGE AdvantEDGE (educational resources programme), SAGE Vistaar (South Asian Rights Programme). Besides these, she is also responsible for managing the joint imprints with Yoda Press, Popular Prakashan, Stree, Samya and Vitasta. As head of marketing, she is responsible for marketing strategy and execution for SAGE’s global product lines. These include all Books, Journals and Digital Products, PR & Publicity, Web Solutions and Design. In addition, she is part of SAGE’s global PR and Branding committee that is responsible for managing all brands within the SAGE stable.